IPS accurately displays an image’s quality and color at a 178° ultra-wide viewing angle. 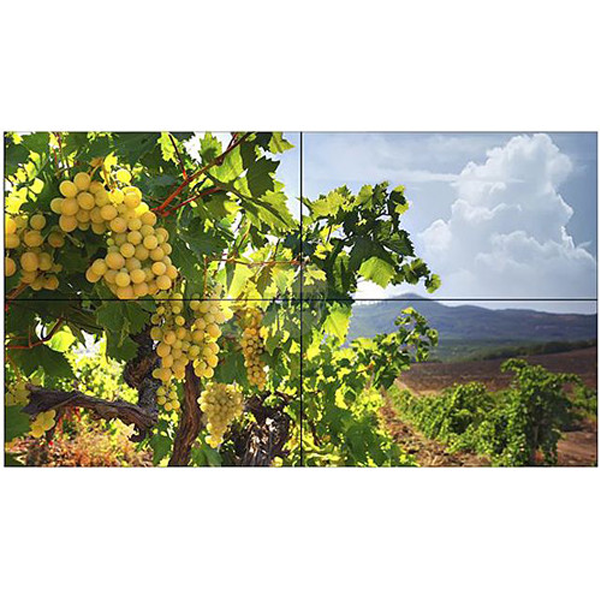 47” class super narrow bezel 47LV35A-5B equipped with IPS (In-Plane Switching technology) technology reproduces accurate and consistent color from virtually all viewing angles. Its super narrow bezel to bezel widths of 4.9mm create a powerful and impactful video wall that will attract and entertain the audience. In addition, its special shine-out film helps deflect sunlight making it ideal to be used in areas that have a high amount of ambient light such as window displays and quick service restaurant drive-through kiosks. Video walls across the world mostly rely on daisy chaining which is necessary for the projection of a smooth and continuous image across the length and width of a single video wall. Daisy chaining is the ability to pass the video single smoothly and fluidly from one panel to the next across the entire video wall. Most competitors in the arena of video walls have been offering traditional video walls in which daisy chaining is a slow and tedious process. Users are required to connect LAN cables to each and every panel separately to illuminate it. Now with LG 47LV35A-5B users can set up an entire video wall with the help of one single LAN cable through a LAN input provided at the rear side of the video wall setup which greatly reduces time and effort to set up your amazing video walls. In the past, LG used display port 1.2 multi stream transport to enable a 4K video wall which was limited to a maximum of 4 panels but with the arrival of 47LV35A-5B with its smarter and most advanced electronics inside the panel, there’s no longer a limit to the number of panels that can be seamlessly connected to a 4K UHD source. This means that an entire huge 4K video wall can now be driven by a single 4K signal because of the new daisy chaining capability of the 47LV35A-5B. One of the most daunting task and tedious requirement of setting up spectacular video walls has been the need to set up a unique ID for each panel separately but this LG video wall removes the headache and allows users to set up IDs for all the panels at once. Q. Is the image distorted at wide angles in LG 47LV35A-5B Video Wall Display? A. No, its IPS technology ensures that the color and quality of the image is preserved even at wide angles. Q. Can I set the timing for content repetition in LG 47LV35A-5B? A. Definitely, schedule based timing allows users to manage the content repetition time throughout different times of the day. Q. Does the screen show hotspots in LG 47LV35A-5B Video Wall Display? A. LG 47LV35A-5B’s screen works perfectly without any hotspots within a temperature range of 230F. Q. Is content sharing possible with LG 47LV35A-5B? A. Yes, you can easily share content with other media players as well. Q. Does the panel spacing distort video quality in LG 47LV35A-5B Video Wall Display? A. Not at all, the bezel to bezel width is just 4.9mm which ensures a uniform and smooth display across the wall.